On Katrina Kaif's birthday today, actor Shah Rukh Khan treated fans of the actress with her first look from their upcoming film Zero. 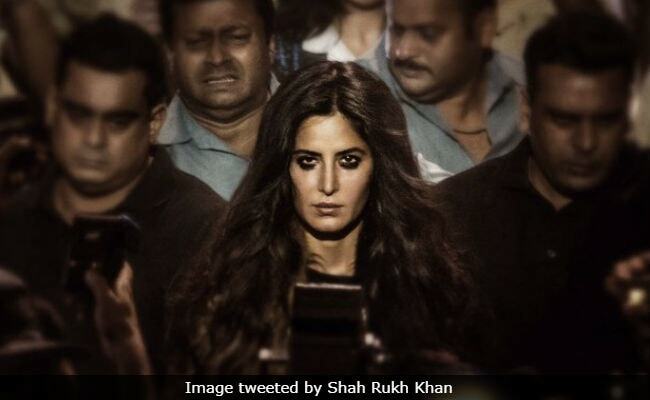 Shah Rukh shared a picture of Katrina Kaif, with kohl-smudged eyes, mobbed by the paparazzi looking ahead of the crowd with a stiff expression. Shah Rukh Khan wrote: "There are so many lovely pictures of her but this one speaks to me beyond my friends beauty... Hope you all also give it love." Along with Katrina Kaif's first look, Shah Rukh also shared a note describing Katrina, which he ended in typical SRK-style: "Aapka pata nahin, lekin mujhe toh gusse mein yeh aur bhi haseen lagti hain..."
Director Aanand L Rai also shared the same poster and wrote: "Hail the queen!!!! A queen that transformed into a king this time!!! Wish you a very happy birthday Katrina and thanks for making Zero possible!" Actress Anushka Sharma, who also stars in the film along with Shah Rukh and Katrina, captioned Katrina's character poster: "You're going to wow everyone in Zero." In Zero, Katrina Kaif reportedly plays the role of an actress battling alcoholism. Meanwhile, Katrina Kaif celebrated her 35th birthday in England, the pictures of which were shared by her fan clubs (apparently initially posted by her mother Suzanne Turquotte). Zero is expected to release in December this year. But before Zero, Katrina will be seen in Thugs Of Hindostan, co-starring Amitabh Bachchan, Aamir Khan and Fatima Sana Shaikh.